Using social media and video to leverage more leads and business has been on the rise in the real estate industry. Over the last few years, we have seen a handful of these real estate professionals find significant success on these platforms. Like all marketing methods, there are upsides, downsides, tips, tricks and many more things to think about. 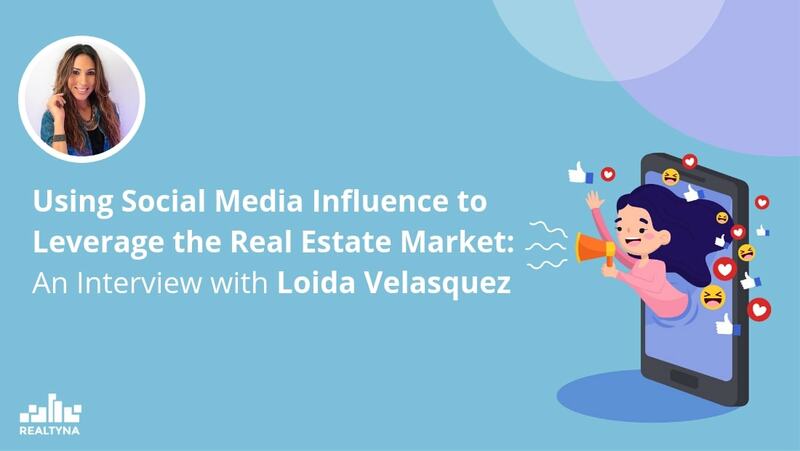 For our Special Guest of the Month, we sat down with real estate agent and social media rockstar, Loida Velasquez, to get the scoop on how social media can change everything! Loida is a real estate agent for Team BC in Southern California. Before real estate, Loida was in the marketing & advertising industry working as an independent contractor for companies. While this career allowed her to travel and meet a lot of people, she was discontent with the atmosphere she was surrounded by. This discontent lead her to make the switch to the real estate industry where she could settle down, be her own boss, make unlimited commission, build a positive work environment and be the leading factor in her own success. And that is what she found. In December 2014, she decided to part ways with her previous career and from the next month, she was shadowing and learning before even getting her license. With a license in hand, Loida started getting experience in door knocking, cold calling and video vlogging by the following summer. By winter, she had listed her first home. With her consistent efforts in making contact with leads and posting to YouTube, Loida’s career has bloomed into what we see today. In just under 4 years, Team BC grew to 4 members and Loida’s following has grown to over 50K between all platforms. As mentioned before, Loida’s success was not instant, and did not come without hard work. Loida shadowed for months before her license, and then began learning the art of door knocking and cold calling by a lot of trial and error as well as scripts. For 5 months, she fine tuned and perfected these skills and quickly learned how to counter people’s objections and speak with a sense of authenticity. In November of 2015, she dialed a wrong number for one of these cold calls. To her surprise, the wrong number referred their parents. It took 8 follow up phone calls and lots of patience, but the parents of this wrong number decided to list later the next month. It all started with an iPhone and a YouTube account. Loida’s team lead, Bryan Casella, saw that social media was an exploding platform for the industry and not very many women utilizing video. So, at the advice of Bryan, Loida committed to publishing 1 vlog per week. Nearly 4 years later, Loida has over 35K subscribers and still religiously posts once a week, only difference is, she moved on from her iPhone to stronger equipment. Although door knocking and cold calling were the backbone of Team BC, the success in building their social brand cannot go unnoticed. It took about 3 years, but in the last year, Loida’s following exploded. It is now a vital aspect in her marketing strategy. She mentioned that her social brand has helped her business in many ways, and one of the biggest is the boost in credibility. She is able to use video for prospects and give an added sense of authority or expertise in the industry. An added bonus are the transfer of referrals between her and her network, as well as the people who specifically reach out to her from her videos. She said the only downside to a strong social brand are the “trolls,” but she simply ignores them and maintains her positive atmosphere. While these videos do take a considerable amount of effort and thought, Loida plans videos by using interesting daily tasks and viewers’ questions as inspiration to save time and be more efficient. On the other side, Loida is very conscious to maintain her strict working schedule. To maintain her work-social-life balance, a typical day for Loida is prospecting in the morning, follow ups & appointments in the afternoon, family time in the evening and videos happening in between. Overall, the effect has been really surprising to her, but equally as great as Loida is able to help other agents with their experiences. Loida’s biggest advice for people who want to grow their social brand, specifically on YouTube, is consistency. She said there are other things to consider, too. For example, it is good to think about the audience you are trying to reach and the content you want to create before you even start making it. Loida explained that the best videos come from explaining the things you already know. Eventually you will become more comfortable with the camera, better at presenting yourself, and more have fun when you stay consistent with your uploading. As far as SEO is concerned, Loida’s success in ranking came slowly, but automatically through her consistent posting and interlinking between her accounts. Loida mentioned that no social media is really above another, as they are all up for grabs. Especially as more millennials enter the market. Each algorithm is different, but from her experience, YouTube prefers content that keeps viewers on YouTube longer. Because of this, Loida suggests you focus on your watch time rather than views or likes. Aside from social media at her side, Loida’s biggest lead generating tool is cold calling. She has slowly become an expert in cold calls, scripts and responding to objections which you can see evidence of on her YouTube channel. As she became more comfortable on the phone, she could predict objections and guide the conversation her way. Her biggest advice and what she feels makes her different from the rest, is that she always comes from a place of authenticity and wanting to help, rather than making money. Her area of expertise are expired listings. She said that from the beginning, new agents are jumping after hot leads, which expired listings are. She simply got really good at it. Now, a significant part of her day includes making contact with the expired listings, as well as FSBO’s. She said one difference is that no one else wants to deal with FSBO’s. She even admitted herself that they can be scary, but the ones who decide to hear her out make it worth it. Her approach is always to get them to realize that their home is their biggest asset and should be treated with care. Most FSBOs do not know contracts, paperwork or negotiation, so she is sure to assure them that it is in their best interest to work with someone. Even if it is not her. For example, one FSBO needed to relocate out of state the following month, so he just went FSBO thinking it would be easier. After a cold call with Loida, they met the following Wednesday, took pictures on Friday, and had 5+ offers by the end of the weekend for $15,000 over the asking price. These kind of clients are her motivation and the reason she loves working with FSBO’s and expireds. Realtyna is a real estate tech company, so of course we had to ask about technology. For Loida, the most valuable technology she uses is her CRM. It is an important tool she uses to follow up with and track leads. Loida also mentioned that her IDX system plays a role in her lead generation and keeps leads browsing with her, rather than Zillow. Similarly, the biggest issue Loida sees in real estate tech is the presence of the Zestimate since it affects the clients mindset on pricing, while usually inaccurate. On the other hand though, Loida strongly believes Zillow overall won’t affect those real estate agents, like herself, who know their true value in the industry. Some final thoughts and advice from Loida to new agents are to always follow through, and overcome your fear. Her mindset is, if she messes up, chances are, she won’t ever see or speak to that lead again, so the risk is worth it when she can make 10’s of thousands of dollars. Additionally, she encourages agents to find their mindset and live it out. The business can be a big emotional roller coaster, but the reward is so much greater. Can Real Estate Agents Work From Home? What Is a Typical Day In the Life of a Real Estate Agent?